The course is available at anytime during daylight hours but is reserved for our members at the following times. Because we operate a “multi-tee start” for members, you will need to be finished before they begin. 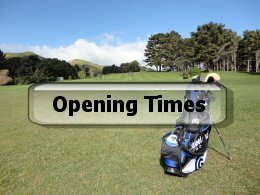 * Affiliated players are welcome to play during our “members only” hours but must report to the clubhouse by 12 noon on Saturdays, Sundays and Wednesdays. Please note that a competition fee of $2 applies to enter the Club’s events. There is often room for others during club play on Tuesdays and Sunday afternoons, but priority is given to members. There may be other times when the course will be unavailable, however these will be posted on the whiteboard in the clubhouse foyer.